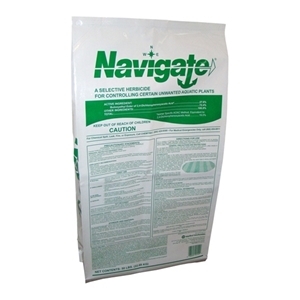 Navigate Granular Aquatic Herbicide is a selective herbicide formulated to control water milfoil, water stargrass, bladderwort, white and yellow water lily, water shield, water chestnut and coontail. Water use is restricted for non-turf irrigation and drinking (human consumption), see label for details. For best results, spread this product in the spring and early summer, during the time weeds start to grow. If desired, this timing can be checked by sampling the lake bottom in areas heavily infested with weeds the year before. If treatments are delayed until weeds form a dense mat or reach the surface, two treatments may be necessary. Make the second treatment when weeds show signs of recovery. Treatments made after September may be less effective depending upon water temperature and weed growth. Occasionally, a second application will be necessary if heavy regrowth occurs or weeds reinfest from untreated areas. Sold Individually, Pallet = 40 x 50 Lbs.